Fr. Peter Damian Fehlner, OFM Conv., was born in Dolgeville, NY on July 20, 1931 and passed away on May 8, 2018. He was a son of the late Herman and Mary Elizabeth (Considine)Fehlner. 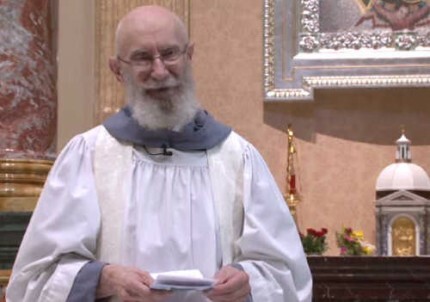 He was often seen on EWTN - and gave some homilies at their Mass. In addition to his Franciscan family he leaves his brothers Francis Fehlner, Thomas Fehlner, and William Fehlner. His brother James Fehlner predeceased him in 2009. Father Peter Damian entered the Franciscan Friars Conventual Novitiate in Middleburg, NY on August 12, 1951. He professed his Simple Vows on August 17, 1952, and his Solemn Vows on November 1, 1955. He was ordained to the priesthood on July 14, 1957 at the Basilica of St. Alessio in Rome, Italy. An avid scholar, he received a Doctoral Degree (S.T.D.) from the Seraphicum (Rome) in 1959. His exceptional dissertation was entitled “The Role of Charity in the Ecclesiology of St. Bonaventure.” He became regarded as one of the world’s leading experts on the writings and theology of St. Bonaventure. He was assigned to St. Boniface Parish in Montreal as Assistant Pastor in 1959 for one year. Over the next 25 years, Fr. Peter Damian taught dogmatic theology at St. Anthony-on-Hudson Theological Seminary, Rensselaer, NY. While there he served as the Rector and Guardian from 1970-1976. He also served as the Librarian for the Seminary and during his tenure the theological library became a world-class collection. Through the years he also held a position on the Pontifical Faculty of St. Bonaventure in the Seraphicum, Rome, Italy. In 1984, Fr. Peter Damian moved to Casa Kolbe in Rome, where he became the Assistant International Director of the Militia Immaculata, and editor of Miles Immaculatae. In this post he became renowned as a speaker at conferences, retreats, symposia, and media events – activities which would continue for the remainder of his life. In the mid-1990’s, Fr. Peter Damian transfiliated to the Franciscans of the Immaculate, a religious congregation with its origins in the Conventual Franciscans. As a friar, he continued his ministry of teaching and writing. In 2015, Fr. Peter Damian returned to his original religious Order of Friars Minor Conventual, re-professing his Solemn Vows as a humble follower of St. Francis of Assisi. Fr. Peter Damian’s scholarly genius was recognized by academics at Notre Dame University, South Bend, IN in 2015, at a symposium dedicated to his theological writings. A Festschrift is being published in his honor this year, at the same time as the 6-volume critical edition of the Collected Writings of Fr. Peter Damian Fehlner, OFM Conv. is being carefully redacted. In 2016, the Mariological Society of America bestowed upon Fr. Peter Damian its highest accolade The Cardinal Wright Award. Fr. Peter Damian will lie in state at the Basilica of St. Stanislaus, Bishop and Martyr, 566 Front St., Chicopee, MA, Thursday, May 10 from 3-8 PM, followed by a Franciscan Wake Service. On Friday, May 11, a Mass of Christian Burial will be held at St. Stanislaus Basilica, at 11AM. Visitation will take place from 9-10:45AM. He will be buried at St. Stanislaus Cemetery, Chicopee, MA. Memorial donations may be made to the Franciscan Education Burse, 12300 Folly Quarter Rd., Ellicott City, MD 21042.